Pineapple Cabana - October 2013 "This is an awesome rental house!" The entire process from making reservations to check out was smooth. This house provided ample room for our entire family to spread out & have their own space. Having a private pool in the backyard was especially nice. The golf cart provided easy transport of all our beach paraphernalia to & from the beach a breeze. Easy walk to the beach up the drive & across the road. This home comes packed with all the cooking equipment you could possibly need. Very easy to find & close to everything we wanted to do. The host was very gracious. The only things I didnt like was on the departure prep instructions there was an item to not put the comforters in the dirty laundry, they would decide if they needed cleaning. And we experienced problems getting the internet to connect consistently. We didnt bring a pet although the home is pet friendly, there were no odors or pet stains at all to indicate pets ever stayed there! All in all this home is a wonderful stay & we would all highly recommend it. Royal Palms Villa - Jul 2012 This was a GREAT house for my family! The location could not be more perfect. About three houses away from beach!!!! We had no idea we would actually be so close. Pool and outside kitchen kept us in the water all day long. Lots of spare sheets, pillows etc to accommodate as many people as you have. The house is cuter than the pictures. There is also an ocean "view" from the front porch :). House was well maintained and well stocked. Mould absolutely rent here again. Southern Comfort - Oct 2011 I cant believe this is the same house, we stayed here last year and loved it, but now its like a brand new house. Loved the new kitchen with granite counter tops, all new furniture, and "Miranda", our very spoiled dog even liked her new pet yard. Great job Rick and Debbie. Well definitely be back, hopefully this summer. PS we all liked the hammock in the back yard too. Ocean Breeze - July 2011 This was our second girls retreat to Destin and the second time weve rented with Rick and Debbie. The house was amazing and the beach is at the end of the street. The neighborhood is very peaceful and everything was just perfect. Thanks again for making our vacation a restful and wonderful experience. Southern Comfort June 2011 As expected, Southern Comfort was another great property offered by Rick and Debbie Scali of Easy Street Pet Friendly Vacation rentals. This was our third vacation with them and everytime we have been more than satified with out accomodations. Its always great to take the four-legged babies too! Southern Comfort offered the hot tub which was enjoyed and the privacy of your own pool with some of the properties is a great plus. You spend hours at the beach during the day and come home and enjoy the rest of the day and evening at the pool. But dont forget to visit all the great ammenities and fun that Destin offers. Thank you for another great vacation and we will be returning soon. We have recommended your properties to lots of our friends and some are scheduled to visit. Cottage by the Sea May 2011 I have absolutely no complaints about Cottage by the Sea! My family and I stayed here (with no pets) and it was the perfect setting. The beach was close enough to walk to, the pool was great for days we just wanted to chill out and the house made us feel right at home. The photos were very true to life. Ahh, I miss Destin so much! I would definitely recommend this house to friends and family! What a great vacation! Thanks so much! 5 out of 5 rating. Vacation Paradise - We had a wonderful stay at this property. It was very nice and large enough for us to spread out. The short walk to the beach was perfect. Just far enough to get the sand off our feet by the time we were back. It was a relaxing and enjoyable stay and I would recommend this place to anyone. Pineapple Cabana - This was our second year at the Pineapple Cabana. I have stayed at several other rental houses in the Destin area and this by far is the BEST house I have ever stayed in. The house is so wonderfully set up and stocked. Rick and Debbie are the most gracious hosts! My husband and I truly do feel like you are going home when we are on our way there. This year we were overjoyed that our grandchildren could come and stay with us for a couple of days. We had a blast in the pool. And all of the beach supplies that are at the house....WOW. They thought they were at a store! Most of all we love this house because our four legged babies can travel with us. There is nothing better than sitting on the swing in the morning with a cup of coffee and having a puppy running in the grass toward you! There is a saying "A rainy day at the beach is better than a sunny day anywhere." The person that said this must have also visited the Pineapple Cabana! See you next year! Coconut Palms - The 2 houses are a great setup for multiple families. We had 14 people with us for three of the seven days we stayed at Coconut Palms and we never felt crowded. There is enough room for everyone to gather and eat and plenty of beds for sleeping. The children (& adults) really enjoyed the pool and outdoor area (patio, music, grill). The golf cart was an exceptional amenity and made trips to the beach very easy. Mr. Scali delivered a new blender to the house when we realized that there wasnt one. Thats service you just dont get every day! I will definitely recommend Coconut Palms to friends and family and look forward to a return visit in the future. Southern Comfort - Dear Rick and Debbie, Thank you so much for our vacation again. This is our third year and we have had a great trip every time. The house was clean. We loved having the fenced in yard for our dogs. We loved having the in-ground pool with the extra bonus of a hot tub. The hot tub was nice because we used it every morning early and at the end of each day. We liked having the golf cart. It was nice being able to use that on the side streets for getting items to the beach, going to restaurants or just shopping. We could not have asked for better weather. Sorry we did not get to do dinner with you guys this year, but next time we will. Thanks again for setting up the photo session with the dogs. We really enjoyed this trip and house. Can not wait to come again. 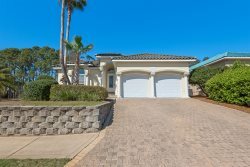 Ocean Breeze - What a wonderful vacation home, huge private pool, fabulous backyard, close to the beach and a golf cart. The girls and I loved the beach and loved the pool, but we really loved the golf cart. I would recommend Ocean Breeze to anyone, in fact we have already told our friends when we got home. The hardest part of the whole vacation was leaving, but well be back. Banana Cabana - This property was perfect for our family of 10 (6 adults and 4 kids)! The space inside was more then plentiful - we never felt crowded. The pool area was also spacious. The house is in tip top shape. The short walk to the beach was no problem. Plenty of restaurants within walking distance as well. We had a 5 star vacation thanks to the Banana Cabana! Beachinit - I WILL NEVER STAY IN A CONDO AGAIN!! We had the most amazing experience staying at "Beachinit". Who would have thought a rental property would have so many personal touches to make a stay so enjoyable? The house is absolutely amazing and stocked with anything you could possible imagine needing. We had a blender for daiquiris (poolside, of course! ), ironing board and iron, even an egg slicer for our egg salad sandwiches! There was not ONE thing we reached for that was not there! That is way more than I can say for the swanky condo we normally stay in. The house is so clean; my mom actually asked me if I was sure we could have pets! The pool is gorgeous and private and the owner was even kind enough to include rafts, floaties, etc. to enjoy. One of our favorite experiences was the GOLF CART!!!! We had so much fun exploring the area, going to the beach, visiting the different shops and restaurants, even getting hot dogs and ice cream! I can not say enough about our amazing experience, if you are thinking about visiting BEACHINIT, dont think, just BOOK IT! You will have the most amazing time of your life. If you have pets or dont, this place is amazingly spotless. Mr. Rick Scali is awesome and it was a treat just visiting with him. We look forward to coming back! Coconut Palms - We had two families for a total of nine people and had plenty of room and then some. We all had a great time and loved the House, the pool, the golf cart and everything else. The ability to play music outside at the pool is a great touch. After having used the pool everyday, we inquired about tools to vacuum the pool after a few days into our stay and someone showed up within an hour to vacuum it for us, WOW!!! what service. I will recommend Easy Street Pet Friendly Vacation Rentals to anyone looking to stay in Destin. I hope we are able to make it back again soon; we all miss the beach and the house already. Thank you for making our stay so enjoyable. Pineapple Cabana - What can I say about Pineapple Cabana-Upon arrival, youve just made it back home! Away from the hustle & bustle of vacationers, Rick & Debbie have provided an Oasis surrounded by the beauty of the ocean. Its comfort, tranquility & style exemplifies pure pleasure & relaxation. Its truly home away from home. My wife, her brother & wife visiting from Germany & our two dogs fell in love with the place. The sunrise & sunsets were magnificent. After an early morning swim at the pool, a nice stroll on the beach, sight seeing, shopping & restauranting, we really enjoyed the peace & quiet the Pineapple Cabana offered. Next time itll be just my wife & I.
Coral Cabana - We had a wonderful vacation! As you know, this is our third year in the Coral Cabana. Each time it gets better. The house is so comfortable that it almost feels as though it is our personal vacation home. Having four young children, its often hard to find nice places to stay that comfortably accommodate all of us. The Coral Cabana definitely fits the bill! The neighborhood is so quiet and peaceful. We love having our own private pool and the porch and lawn are major pluses. On days we dont feel like going to the beach, the kids are able to play outside while Bob and I relax on the porch swing. We also like that there is no waiting for elevators or stairs to climb. All the improvements you have made to the property look great. Thanks for making our vacation so comfortable and worry free. We will see you next year!